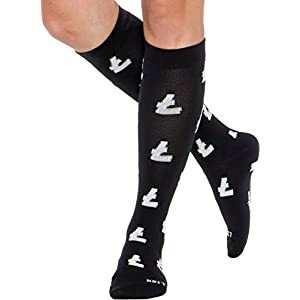 FOR THE CRYPTOCURRENCY CONNOISSEUR – Pay tribute to coin in all its forms with these stylish currency compression socks! Each sock features a unique all-over print, displaying the symbols for the world’s most famous currencies, both digital and analog. KNEE LENGTH 15-25 mmHg COMPRESSION – With a graduated compression level of 15-25 mmHg, our compression socks are specially designed for everyday use. Wear them to work or while lounging around the house, and stay comfortable! MINIMIZES SWELLING AND SORENESS – Standing or sitting for long periods can be hard on your feet and legs, causing them to ache and swell. LISH Currency Compression Socks compress your leg from the ankle upward, promoting better blood flow to reduce swollen feet, leg cramps, and help reduce the risk of DVT.